I'll be the first to admit that I'm a fan of Final Fantasy. I have heard a lot about FFXV in the past few months, but at PAX West, I encountered way more FFXV than I thought possible. Square Enix went all out marketing the game during the con; so much so that I literally could not escape it. Luckily, I was able to snag some hand on time among the many other attendees hypnotized be the relentless media onslaught. Seriously, it was everywhere I went. 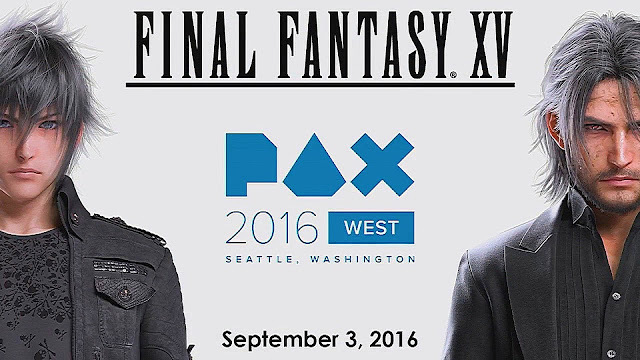 From huge banners outside the exhibition hall, to tiny flags with the title being waved everywhere, FFXV was at PAX West in a BIG way. I would have expected that I could get away from it once I stepped out of the exhibition hall, but lo and behold, Square contracted with Uber to outfit a bunch of Mini Coopers to look like freaking chocobos, complete with giant yellow feathers and appropriate theme music. Can you imagine being someone totally uninvolved with games, just trying to call for a ride home and being greeted by a guy dressed in a yellow bodysuit like a half plucked Big Bird in a matching Mini Cooper?! This was the coolest of the PAX West FFXV Uber cars, though you can see the terrifying yellow bodysuit dude in the truck. Anyway, to the game. I have to say, the graphics are just incredible. I think we've always known Final Fantasy to have beautiful cinematics, but the in game graphics often didn't match. The in game graphics in FFXV are the closest thing to cinematic quality I have seen yet in the series. The gameplay is about what I had expected, given everything I have heard. What I didn't expect was just how smoothly everything worked together. I'm used to the turn based combat in previous titles feeling a little disjointed moving between each team member, but FFXV's emphasis on combos and real time combat really smoothed that experience out. The party members really felt like they worked well as a team and it made the whole experience better for it. I can't wait to play the full game. I'm interested to see how the characters interact outside of the combat sessions and where the story takes them.